An Amorous spy drama set in Elizabethan England. Full of pretty boys and ambitious women. Seduction, greed and deception lie at the heart of a bitter rivalry over the crown. Friend or Foe? Who can you really trust? An unexpected execution is one entertaining drama set filled with lies, seduction, greed and deception. It is sure to bring out the inner historian in us all! It is a new version by Emma Willis based on the play Mary Stuart by Friedrich Schiller and directed by Roz Riley. The performance brings on a modern twist to the bitter rivalry of Mary Queen of Scots and Queen Elizabeth 1 over the crown of England. The presentation focuses on the last part of the life of Mary Stuart and the intense political dealings of the English court under the ruling of Queen Elizabeth. The strong and enthusiastic acting, along with the reminiscent language and simple yet effective costumes really immerse you back to Elizabethan England. Mary Stuart is portrayed as a strong willed and emotional woman who throughout her life has lived both happy moments, yet has conjured evil deeds to feed her appetite for love and power. She finds herself heavily denied of freedom that she feels she rightfully earns. Queen Elizabeth is presented as a woman who is devoted to her royal duty yet yearns for love and is unsure on who she can really trust. The other actors / actress's bought their own personal touch for the characters to this astounding play, from Davison adding a humorous levity to the performance as both the Queen's guard and helper, however, she becomes a tragic victim of her position at court... The play starts to show us one by one who is a true friend to the evillest enemy from the sly, sleazy and evil Lord Burleigh, to the Earl of Leicester's own treachery; it keeps you on the edge of your seat. This is truly one intense production and perfected with such grace and genuineness. It is a history lesson for those that do not fully know the story behind these two powerful Queens. The acting was faultless and the whole performance was mastered with such elegance and a touch of humour.... making it a joy to watch! A three-hour historical play might not sound like everyone?s cup of tea, but Factory Space Theatre?s An Unexpected Execution contains enough royal rivalries, murder plots and political intrigue to satisfy anyGame of Thrones fan. Directed by Roz Riley, An Unexpected Execution is an adaptation of Mary Stuart by 19th century playwright Friedrich Schiller. As the name suggests, it tells the story of the final days of Mary, Queen of Scots ? albeit with a few liberties taken with the historical accuracy, and comic relief in the form of the irreverent, fourth-wall-breaking Davison (Melissa Kathryn Rose). For instance, one of the play?s pivotal scenes ? a meeting between Mary (Michela Carratini) and Elizabeth I (Dimity Raftos) ? never actually happened. Raftos? Elizabeth is imperious but sympathetic as a queen unwilling to spill blood but knowing her survival relies on it. Carratini as Mary alternates between sweetly beguiling and righteously angry at her treatment by the hands of the ruthless Lord Burleigh (Daniel Csutkai). Factory Space Theatre Company's production of AN UNEXPECTED EXECUTION by Emma Wills is a powerful & dramatic presentation of the last part of the life of Mary Stuart and the political dealings of the English court under Queen Elizabeth. This adaptation is based on the play MARY STUART by the great German playwright Fredriech Schiller. The evocative language, uniformly strong acting and inventive set bring to life what could have become a dry history lesson. As the writing, lyrical in parts, bitter in others, gradually reveals the historical aspects of the story, the drama and tension build, particularly during the second half, to its deadly conclusion. Michela Carattini as Mary Stuart portrays with strong emotion a woman who has lived life but carried out some evil deeds in the name of love and power who finds herself denied all freedom. 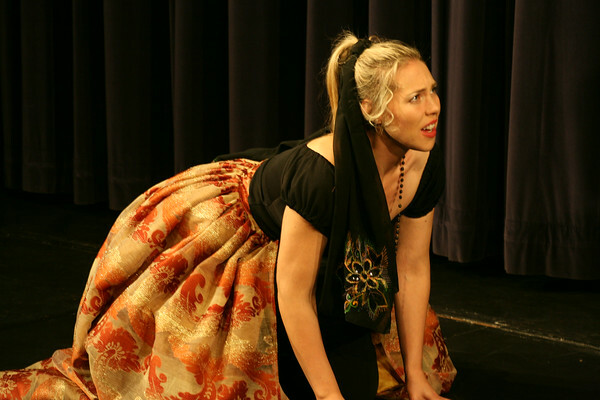 Dimity Rafos as Queen Elizabeth forcefully shows a woman intent on her duty yet yearning for love. The Queen is caught in her power not knowing who to trust but also using this power ruthlessly. This all intertwined with the religious battle between Protestants and Catholics. Melissa Kathryn Rose as Davison humorously adds some levity to the play yet in the end is a tragic victim of her position at court. Samantha Beames as Hanna gently fulfills her role as Mary?s faithful servant. Deb Mulhall plays with dignity and poise the character of Paulet, Mary's jailer. Daniel Csutkai slides easily into the role as the sly, sleazy Lord Burleigh, and Roberto Zenca as the Earl of Leicester passionately confronts his own treachery as he swings from supporting one Queen to the other. Ross Scott is very solid as Talbot. Luke Middlebrook as Mortimer effectively develops the character from an idealistic supporter of Mary to uncontrolled passion and ultimately self-destruction. The inventive set, which uses the first few rows of seating as Mary?s prison (designed by Roz Riley and Deb Mulhall), the fairly simple yet cleverly designed costumes by Suzanne Hauser, and the lighting and soundscapes all add to the atmosphere and mood. Roz Riley clearly directs her actors to a make this an intense and gripping production. Recommended viewing, AN UNEXPECTED EXECUTION is playing the Star of the Sea Theatre in Manly until July 19. How would you like to see a well-written, well wrought, historically-based theatrical drama packed with political intrigue, betrayal, rivalry, hypocrisy , harrowing emotions, lust, power plays and much, much more? Well, here?s AN UNEXPECTED EXECUTION? a version of Friedrich Schiller?s powerful play MARY STUART (1800). AN UNEXPECTED EXECUTION is an English version formed by Emma Willis. With this, Friedrich Schiller?s level of storytelling is up there with Shakespeare?s. Brilliant. AN UNEXPECTED EXECUTION is beautifully directed and perfectly cast by Roz Riley. The actors are all wonderful and play crucially, effectively and passionately. They all deserve to be named for their fine efforts. AN UNEXPECTED EXECUTION focuses on the final days of Mary Stuart, Queen of Scots (Michela Carattini ) during the turbulent reign of Queen Elizabeth (Dimity Raftos). AN UNEXPECTED EXECUTION is a great play. ?Which mask is the real face?? So asks the très très amoureux Leicester in this highly charged royal drama, played out with lavish wit and wickedness in the courts of Queen Elizabeth I. This version by Emma Willis is adapted from Friedrich Schiller?s Mary Stuart. Mary Stuart, Queen of the Scots, languishes in her prison at Fotheringay while Elizabeth I deliberates as to the fate of her cousin: should she be executed or not. Simple? Not at all! As Elizabeth listens to the counsel of her seemingly loyal lords, as we learn of Mary?s ?immoral? past, as we see allegiances change, betrayal afoot and manipulations aplenty, nothing is clear. Is Mary a sweet soul terribly wronged or a scheming widow? Is the Virgin Queen above all petty human emotions such as love or is she as mortal as the rest of us? Is that knife blade about to slice someone?s throat or cut a juicy apple? Nothing is as it seems. And that is what it so spellbinding about this production. Concealment - wicked concealment - is the name of the game. Thick curtains hang down, some half-raised, all the better for lurking lords to hide behind, watch and wait? Down below - in an inspired use of space - the front rows are swathed in black to become the dingy dungeon of Mary as she awaits word of her sentencing. In these two realms, the action is set. Scenes bleed into each other - we see Mortimer kneeling at Queen Mary?s side in a poignant moment, Mary clutching a letter, while above Elizabeth goes about her queenly business. The beauty of this production is in the spaces; not just the physical spaces. The pauses between speech. Sometimes the words tumble out like earnest young Mortimer's feverish rantings. Sometimes there are cold precise words that cut like daggers - like the deadly yet undeniably attractive Burleigh. Sometimes the words are simply delicious ? like the honey-coated assurances of the slippery & highly amusing Leicester. Then there are the words of quiet torment like Elizabeth as she struggles with her duties as a monarch to her God, to her people, to the man she loves, and to herself. And there are moments in this production when there is silence. A dreadful foreboding silence. Getting back to you after my seeing An Unexpected Execution. It's a period of history I know little of and much was enlightening in that regard as were the imagined machinations of the minds of its characters. I especially enjoyed the direct address of the modern (ised?) Davison character and the irony of her journey was a jolly good thing for the drama. You have some terrific actors amongst that lot, Dimity and Michaela my especial favourites. I did wish I had won the lottery so I could grant you an overflowing budget so you could costume it in a richer way than poorer companies are able to. A valiant choice in the circumstances, though I thought the men seemed to work better than the women with that economical choice. The use of the first few rows of the auditorium doesn't work so well. Varying sightlines and sometimes difficult to hear dialogue made it a space to be thinking about rather than surrendering to the play's action. And it's so clumsy an area. If only you could pull the seats out. You need a larger canvass for you vision I think.